October means cooler weather and... New Items!! Hello to all of our quilting friends out there! long since you have heard from us...but we've been BUSY!!! First, it's OCTOBER!!! Which means NEW STUFF!! & 2 new panels for our 2018 Fall Line-up! 1.) 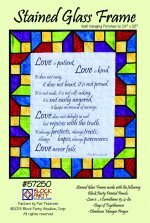 "Stained Glass Frame" Pattern with "1:Corinthians 13: 4-8a"
"Give Thanks" has variations in the pattern that allow you to make the top with or without the verse blocks. And, each panel has enough blocks for two quilts! show workers & volunteers who made the events great! 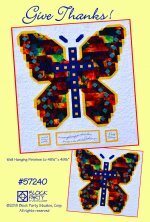 soon at a quilt show near you or in our showroom...take care! Your Block Party Studios Friends!